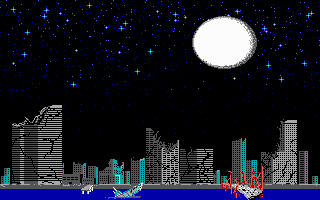 Your mission as Duke Nukum: A plane will fly over Dr. Proton's sieged city and drop Duke on a huge skyscraper. Duke must proceed to Dr. Proton's well guarded hideout believed to be hidden deep underground. 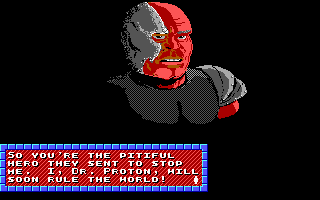 Dr. Proton must be stopped or the world is doomed! Proton: You may have defeated me on Earth, but on the Moon I can make plans for my ulimate attack! Duke: Proton, you coward! You can run but you can't hide! Proton: Once my forces are together, I'll be back to rule Earth. In episode two, Duke rockets to the moon to infiltrate Dr. Proton's massive lunar fortress. Continue your adventure in "Mission: Moonbase", where you'll encounter: New levels, new puzzles, new graphics, and more non-stop action. Proton: Duke, your lucky ways annoy me. I see now how best to be rid of of your pesky presence. There's IS no place to hide from me. Running back to Earth will not save you. But escaping to Earth's future will! 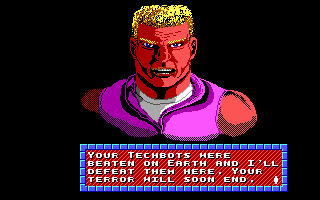 Then my Techbot army can build and return victorious! Duke: Not if I can find a way to stop you...even if I have to follow you into the future...! 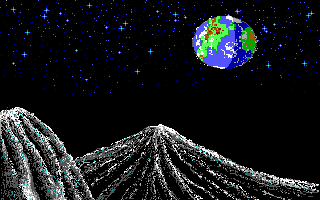 Once again you've given Dr. Proton a major set- back, by destroying his lunar fortress. Continue your adventure in "Trapped in the Future"! Duke must chase Dr. Proton into Earth's future to stop the largest threat yet! EPISODE THREE: TRAPPED IN THE FUTURE! Dr. Proton is finally defeated! 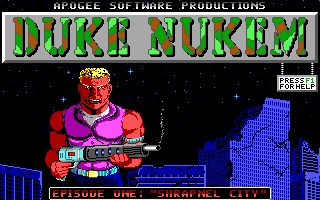 Using Proton's time warp device Duke returns to Earth's present and is presented the key to the city he saved. (Yeah.) Did you locate all the hidden rooms on each level? On your next Apogee games order please tell us your best Duke Nukum high score.